This is an outstanding group of features that you don’t often find in sewing machines at this price level. 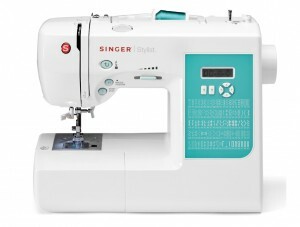 Singer has loaded this machine up with many options that any level of sewing enthusiast would love to have. Is the Singer Stylist 7258 Easy Enough for Beginners? To put it simply, this sewing machine is very easy to use. There are so many thoughtful features on this machine that a beginner is really going to enjoy using it. From the automatic threader to the drop-in bobbin with clear case and start stop button – are all items that a beginner will be thankful for. Another nice feature is the speed controller that allows you to use the machine without a foot pedal. It is great for beginners allowing them to start at a slower speed until they get used to their machine. It could not be simpler to use. Simply push the start/stop button and you are on your way. The documentation and resources that are included are also perfect for someone just starting out. The Ready, Set, Sew! DVD is an excellent companion that will get you to know your machine from top to bottom quickly. The included instruction manual is very detailed and doesn’t leave you asking more questions. For those with a bit of experience there is a Quick Start guide that promises to have you up and sewing in 5 minutes. It is simple to follow and lives up to it’s claim. After going through the Singer Stylist 7258 Quick Start guide I was stitching my first fabric in less than 5 minutes, as promised. While using the machine, my first reaction was how quiet and smooth that it ran. It felt like a much more expensive machine. I was able to try out many of the different straight and decorative stitching patterns and they all worked brilliantly. The sewing speed selector and the start/stop button is something I was curious to try out. The location of the start/stop buttons is convenient and the speed slider is responsive and consistent. I wouldn’t have any problem recommending a beginner to use these features as it makes things a bit more simple when just starting out. Now to get to the real test. Does it do a good job when stitching? I’m pleased to say that I didn’t have any threading or performance issues that caused me any concern. Each stitch type came out as expected and I was very happy with the results. I even tried it out on some heavier fabrics like denim and it worked perfectly fine. I must say that I had a great time testing out this machine and believe most beginners would be very happy if this was their first machine. One other thing to note is the solid metal frame. A frame like this is usually found on sewing machines that are much more expensive, like the Singer One Plus. The weight of the frame helps while sewing by keeping the machine still while you are sewing and especially helps when working with larger, heavier fabrics. Singer Stylist 7258 vs Brother CS6000i – Who’s The Winner? These two outstanding sewing machines are often recommended to beginners and are two of the most purchased machines in North America (ranked 1st and 4th respectively). They are both very good machines that have excellent customer feedback, but which one of the two is the best? As you can see there isn’t much to differentiate the two machines when it comes to their features. The Singer 7258 has quite a few more stitches, but you get a more powerful motor with the Brother CS6000i. Both are pretty even here. Performance-wise both machines are equal as well. The stitch quality is high with both and the two machines have excellent reputations from those that have purchased it. There are a couple of differences of note. First of all, the Brother CS6000i has a quilting table and a hard cover. If are planning on quilting with your sewing machine, this may tip the scales to the CS6000i. However, the Singer has a heavy duty metal frame and many more stitches. There are good reasons to purchase either machine so look over each one carefully before making your decision. If quilting doesn’t matter, then the Singer Stylist 7258 is a great choice. It is inexpensive, easy to use and has all the features you need. This is a great at-home sewing machine that I’m sure you will be thrilled with. If you are interested in more Singer sewing machine models you can read my full review here. I hope you enjoyed my Singer 7258 review and that it helped with your decision. Happy sewing! Yes, the Brother CS6000i does have a programmable needle up/down feature. Thanks for pointing that out. That was an oversight on my part and I have updated the review. I’ve been considering these two machines, and a concern for me is tension control. It is the bane of my sewing experience. From what I can see, it is automatic on the Singer, and manual on the Brother. Can you tell me how they compare to each other? Thank you. I’ve found people have tension issues with the Brother machine more than the Singer. It seems to be more consistent. With the Brother if someone was having tension issues I’ve recommended using metal bobbins in the past. It seemed to fix it. I like that you don’t have to worry about with the Singer and that it does it automatically. If this is your biggest need then I would go with the Singer 7258.